The Provo City Council passed the bike plan last night – unanimously. After many years in the making, this plan lays the groundwork for transforming Provo into city that is truly friendly for all road users including bicyclists, pedestrians, and drivers. It will also be remembered as a happy tribute to our friend and bike advocate Andrew Ungerman who passed away this week. His dedication and work on the plan from the very beginning, made a big difference. Thank you all for your support over the years. There is still much to do, but we now have a very solid foundation for future work. I am grateful for this invitation from council chair Hal Miller to talk about the role of the Provo Bicycle Committee in the formulation of this bicycle master plan. This is a banner day for bicycling in Provo. (This afternoon, I attended a meeting where the BYU administration announced that it would be implementing almost every single element of its Campus Bicycle Master Plan as it completes the Campus Unification Plan.) And tonight, we celebrate an important step in improving the quality of life of our city. Yet my heart is heavy. As some of you know, this last week our community lost one of its most active members in Andrew Ungerman. Since Zac Whitmore and I reestablished the Provo Bicycle Committee back in 2009, after it had been dormant for a number of years, Andrew was a quiet but committed member of the Committee, one of the most consistent volunteers at the Provo Bicycle Collective, and visible year-round riding back and forth to UVU where he was a student. One of my fondest memories of Andrew is decorating cookies with him and Zac in preparation for a ride celebrating the reopening of Provo River Trail two years ago, a ride the mayor and several council members joined. Tonight we will gather at the Court House at 6:30 and participate in another ride—a Ride of Silence in memory of Andrew. In many ways, Andrew represented what the Provo Bicycle Committee is all about—respect for all road users, a healthy environment and active lifestyle, family and friends, quality of life, safety, and most of all community. The Provo Bicycle Plan is a document that can transform our community by making our streets truly public roads and complete streets—welcoming and safe for users of all modes of transportation—drivers, bus riders, pedestrians, runners, and yes bicyclists. The plan is the product of many years of work and collaboration. The city’s Engineering Department deserves immense credit. Years ago working with an earlier iteration of the Provo Bicycle Committee, Engineering had the foresight to create a number of bike lanes throughout the city. Such forward thinking provides Provo with a solid foundation to do something great. We are blessed in Provo to have the 15-mile long Provo River Trail, the most popular amenity in our wonderful park system. It is a community treasure that connects residents with the river, mountains, parks, workplaces, schools, and our history. I commend those who allocated the funds necessary to build the Parkway, and the Parks Department which does an excellent job maintaining this bike/ped path. I’d like to thank Mayor Curtis who has been immensely supportive since Zac and I met with him in early 2010 and he immediately recognized our committee as the Mayor’s Provo Bicycle Committee. He leads by example and it has been wonderful to see his commitment to ride to work 100 days both last year and again this year. I am pleased that he will give the closing keynote speech with Mayor Caldwell of Ogden at the Utah Bike Summit next month in Salt Lake. The Engineering Department and the Bike Committee will also be presenting about our progress in making Provo more bicycle friendly. I’d like to invite the entire council to join us at the summit on April 25th. Bike Utah has indicated they will likely hold the summit in Provo next year. The Bicycle Master Plan was made possible in part thanks to Mountainland Association of Governments. A Stakeholder committee composed of representatives from MAG, UDOT, UTA, BYU, the City Council, several city departments, and one representative from the Bike Committee met for over a year to hammer out the plan. 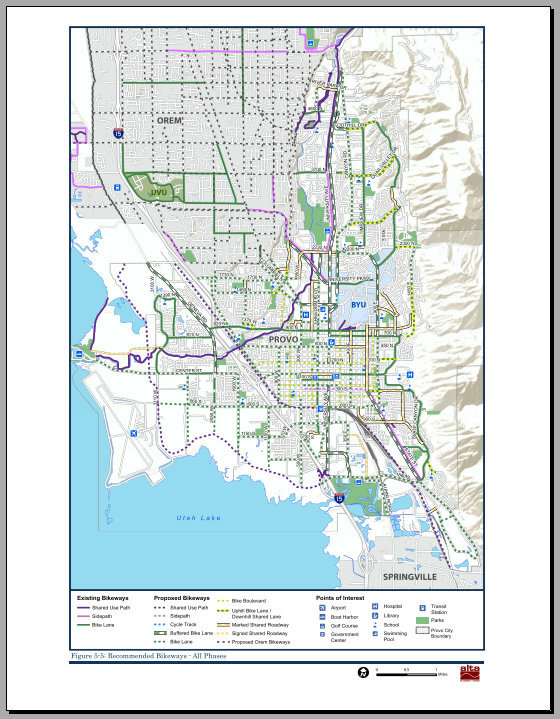 The final technical document was prepared by one of the premier bicycle planning agencies Alta Planning and Design, whose lead consultant Travis Jensen is a graduate of BYU’s traffic engineering program and chair of the earlier Provo Bicycle Committee. Several public meetings were held and according to Casey Serr public involvement and input were extraordinarily high. So too was the involvement and support of the council. During the formulation of the plan, the council and some members of the administration traveled to Boulder, Colorado, for a first-hand look at a world-class bicycle and pedestrian network of over 100 miles of multiuse pathways. We appreciate the council’s support of our efforts to make our community more liveable, family-friendly, and our roads safe for all users. Recent tragic accidents involving bicyclists and pedestrians remind us that there is much work to do. As we as a community create an interconnected network of bikeways and a culture that make it safer to bicycle, people—young and old—will ride Provo will be a healthier, happier, and more livable community. Thank you.